It is hard to deny that life in contemporary universities has become a frenzy of standards, benchmarks and efficiency. A place where staff and students are encouraged to be beyond excellent continuously. All because someone somewhere decided that Education is a business product. The commercialisation/corporatisation of universities has caused us all to be so hurried and harried, striving for more time to get everything on the to-do list completed. So how on earth does a new lecturer, let alone a new course leader cope in this academic climate? I have been in post for just over a year and have only now managed to take a breath and start to reflect on my achievements, my crushing defeats and my ambitions for the future. The one piece of advice I was given by the outgoing head of department at the School of Creative Technologies was: “Survive”. I think I have survived, but I definitely have some spectacular war wounds. This post is an attempt to reflect on launching myself into a challenging post where expectations are high and the potential to fail is just as great. I knew my first year as a full-time lecturer was going to be challenging, particularly in the current climate, but I did not quite appreciate just how demanding Course Leadership was going to be. Here are 10 things I have learnt about the job and myself over the past year. I joined the School of Creative Technologies at the University of Portsmouth as a User Experience Teaching Fellow in February 2017. The department was going through a time of flux and by July I was installed as a Lecturer and Course Leader for the BSc Digital Media degree programme. This was my first teaching appointment after years of Research posts, PhD and Post Doc (at UCL and Durham). During my research career, I was fortunate to gain some teaching experience from delivering guest lectures, seminars and practical sessions, but had no real experience of dealing with students day in and day out. What I lacked in knowledge I made up for with enthusiasm, but it is fair to say I faced a steep learning curve! During the 2017/18 academic year, I taught on 8 modules, two of which I acted as coordinator. Teaching ranged from lectures to over 200 students, to small-scale seminars and very regular computer practicals. 1. You will over prepare for teaching and still feel like you are not doing enough. I like being prepared. It is a safety net. But once term starts and chaos ensues you often feel like you’re just one step ahead of your students in terms of content. I have high expectations of my students, and of myself. I tried to over-prepare lectures, because the thing I am (and let’s face it most of us are) afraid of is feeling incompetent in front of other people. Teaching prep can be a way of trying to control the chaos, but the problem with this is that there are numerous and varied demands on your time, and you can get lost in teaching preparation, but unfortunately you need to crack on with all the other aspects of the job, all the other responsibilities you have to deal with. Learning to give yourself a fixed amount of time to prepare (which is always more than the workload planning model states) is important and try your very best to stick to it. You will always feel like a fraud. Learn to embrace it. 3. Supervising student dissertations is a joy. I found 1 to 1 supervisions with students an absolute joy. Seeing students grow, mature and think critically about research is very exciting. Encouraging students to think a little bit more, to challenge them, to share the highs and to offer support during the lows is a highly rewarding experience. Course leadership is stressful. It can often feel like you are firefighting. There is a continuous list of obligations that you need to fulfil on a daily basis, and this is on top of the ever-expanding lecturer duties. The number and variety of tasks for which you are responsible are overwhelming, and this is exacerbated by the fact that you are held accountable by multiple stakeholders with frequent last-minute deadlines. Expect to be overwhelmed and be prepared to adapt to shifting demands. It is a challenge to learn which plates you can leave to their own devices for a while, and which you have to keep spinning at pace. One of the biggest things I have learnt this year is that this job is unpredictable. It is difficult to understand that your work will very rarely go according to plan. It is a slightly unhealthy balance between reactionary and pro-active. 5. It is important to admit your faults and turn your weaknesses into strengths. I am an introvert, a shy academic and a nervous teacher. This might seem odd to the friends, colleagues and students who know me. But I work hard to keep up appearances, and when in lecture mode I am an amplified, stereotype of my quiet, cautious self. I very much enjoyed reading Shrinking Violets: The Secret Life of Shyness, by fellow shy academic Joe Moran. This book really helped to realise that this perceived ‘weakness’ is actually a strength. Students are opinionated and have no qualms about telling you what they think and expect. As a lecturer and Course Leader, you are vulnerable to indifference, judgement, ridicule, banter and even praise. The majority of the time working with students is delightful. They can be absolutely hilarious. I found the indifference the worst aspect to deal with, and at the start of the year I didn’t have a handle on the students, and they didn’t know how to deal with me. I found it quite frustrating to the point where I was upsetting myself. Transparency and brutal honesty have been a big help. Providing students with some blunt homes truths really changed our relationship. Proper one to one discussions with students are vital. Each and every one of my students matter. Taking the time to get to know them has been really rewarding. I think it is important to listen and act accordingly. Creating an environment where students feel comfortable is important. Having a personal relationship with each student, helps me as much as it helps the students. I try to be student centred and actively present. But caring can sometimes lead to defeat. As I write this, the NSS (National Student Survey) scores have just come in… No improvement on last year’s metrics. I am livid. Learning to let go is not in my skill set yet. The advice a very good friend gave whilst I was an undergraduate was to ‘bend like a reed in the wind, dude’. I still have not mastered this. But it is a work in progress. Student success is brilliant. When students fulfil and exceed what they thought they were capable of, it is wonderful. I was not adequately prepared for just how proud I was going to be. 8. The student experience is, and should be the priority. Despite the focus on quantitative metrics of success (many of which are pretty meaningless), student experience should be your priority as a Course Leader. I am incredibly disappointed that university marketisation is diluting the student experience and decimating any opportunity to create a culture of student consultation and a fully co-created curriculum. There are times where you feel that no matter how much effort you have put in that no one has noticed. There may be circumstances beyond your control which cause you to feel unappreciated. Hard work sometimes goes unrecognised. But the people who matter, your students and your colleagues, they notice and they value your input. 10. Do not give up hope. There will be things you want to change. Nothing is perfect. Try to stay focused on the opportunities and the potential, rather than challenges that can have a negative impact. Departmental (and institutional) cultures can change. Push back when necessary. Do not let your standards slip. There are subcultures of support creating pockets of resistance to the commercialisation. Find your pocket. 10 lessons does feel like a lot. And that’s not even all of it. It is just the elements that I feel most passionate about. There is a lot of information and advice out there for new lecturers, ultimately each of us has to find our own path. The last year has been a challenging, frustrating, exciting, rewarding and an exhausting experience. I do feel like it could have been a bit of a smoother ride, but I would not have changed it. My job is exhilarating. I hope to continue to evolve and grow as a lecturer and as a course leader and to hopefully to remember to listen to my own advice. Last week I was part of a Digital Creative Media workshop for museums and heritage sites organised by the University of Portsmouth Faculty of Creative and Cultural Industries Cultural Heritage Research Group held on 27th July. The event explored opportunities for using creative and digital technologies to enhance museum and cultural heritage interpretation and management, my quick and dirty notes are below. The guest speakers for the event were the equally brilliant Kevin Bacon from Royal Pavilion and Museums, Brighton & Hove and Pat Hadley from Cogapp. Despite coming at it from different angles the overriding message from both talks focused on the fact that any digital experience should never start with the technology and should always be visitor focused and object centred. Kevin started from the position that it is actually quite difficult to articulate the collections online, as it is such a diverse collection. So it is important to think about the collections strategically rather than as a cohesive whole. When it comes to talking about digital, the conversation tends to be framed to touch by the technology. Should we always think about digital as products? If we were a tech company that would be fine. But we are a museum. Digital, therefore, should be about relationships. At Brighton Staff digital literacy is all about transparency and communication. Digital is pervasive. Only 2 actual members of Digital Staff who focus on helping other staff to develop digital ideas and skills. Getting a young person to run the museum Instagram account. Remix the Museum and excellent uses of museum gifs. A very good reminder that being playful with collections is really important! Blogger in Residence. Bringing other voices into the collections. Map the museum – stripping back to a very simple idea. Release raw Collections data to the public, and get people to locate objects on a map, correcting items that are in the wrong place. The data collected helps the museum to learn more about our collections, and the data is also released as open data. Story drop mobile app – reminded me a lot of the TWAM’s Hidden Newcastle app. A way of discovering the hidden histories and surprising stories geolocated across a city. Build in scope for failure. Be happy with a smaller audience. Use your prototype as a real thing. – appreciate this is quite hard to do with public funding. Pat’s slides are available here. First off Pat got us thinking with a Post-it notes exercise about what types of digital technology we use, and what digital stuff we had heard of, but had no clue about. It was an interesting exercise and a great way of seeing where knowledge gaps are. Making museum collections and heritage sites engaging, accessible and useful for today’s audiences. This set of problems is one of the most exciting challenges areas to apply digital technology. Collaboration is key, with staff and visitors, and external partners. When thinking about digital projects you need to consider organisational culture, visitor centred approaches, and content. Joining these up can sometimes be quite challenging sometimes. Ultimately, when thinking about digital projects, other museums are not your competition. The competition is Netflix and Candy Crush. How do museums compete with that? How do people use technology? Unless… you are the audience. How to think through Digital? rather than stuff, stories about the stuff, technology and then people. It should be People first, with a lit bit of stuff, a little bit of stories about the stuff and a little bit of technology. It comes down to what do you want the visitors to leave feeling….? How to write a brief… think about the audience. What do you want the Visitor to feel? At the start of any project, you know the least about the end point. Don’t demand a race car and then realise you need a horse. Find experts – collaborations with external partners, your audiences, your nephew. Get perspective. What can we uniquely do? What problems can be escaped? What is your unique capability to offer audiences? During Museums and the Web 2013 I attended a session about Capturing Visitors’ Gazes: Three Eye Tracking Studies in Museums it was a great session which focused on the lessons learnt from three different eye-tracking studies conducted at the Indianapolis Museum of Art, The Deutsches Museum in Munich, and the Hatfield Marine Science Center in Newport, Oregon. I became fascinated by eyetracking and really wanted to have a go myself but at the time I was in the middle of my PhD and didn’t really have very much brain capacity left for anything else. Fast forward a couple of years and I’m now working on a fascinating project looking at Eyetracking and Spanish Art. We are at the early stages of a project that plays a part in Durham’s Centre for Art and Visual Cultures ongoing collaborative project Spanish Art in County Durham. Turns out County Durham has a rather surprising collection of Spanish art including works by El Greco, Zurbarán, and Goya. Working alongside Andy Beresford and Dan Smith, we are exploring how Spanish Art, museum studies, experimental psychology and digital humanities can work together to ask new questions about how visitors respond to a collection of artworks. We are interested in a range of questions around how people look at and experience art. The experience of art is a complex one, and undoubtedly is incredibly subjective. It involves issues of perception, attention, memory, decision-making, affect, and emotion. So we have a difficult task ahead of us trying to understand the aesthetic and cognitive appreciation of 17th Century Spanish artworks. Where do people look? What are the areas of interest? The face, the hands, the background, the frame? How long to they look for? Do they like it? We’ve just finished the data collection of a small pilot project in which we did some lab based tests using a fixed eye tracking system on a series of digital reproductions of artworks. We will know more once we have fully analysed the data. There is a lot of numbers and spreadsheets, and more enjoyable heatmaps to be looked at. Reflecting on the experience so far, it struck me how much of my personal thoughts about the process revolved not about the project and results, but the interdiscplinarity across disciplines. What I have found so far is that my research ideas align much more strongly with experimental psychology than I realised. I always find it fascinating to see where else I could potentially sit in the academic spectrum. Since I started my academic career I have been situated within four different departments at three different universities: Departments of Archaeology, History, Information Studies and now English Studies. Perhaps a psychology department beckons in my future? Yet I keep doing the same thing, which I now label as digital humanities, but will perhaps be called something else in ten years’ time. This project may well be about Eyetracking and Spanish Art but it is also about readjusting disciplinary boundaries and assumptions to accommodate new forms of research which have not been adequately recognised previously. I have found ever since I was an undergraduate that what I want to study simply does not fit comfortably in pre-existing disciplinary structures, because those structures simply disregarded the kind of engagement with the digital and cultural heritage materials in which I was interested. Working on the Eyetracking and Spanish Art project which crosses a range of traditional disciplinary boundaries is promising and demonstrates the strength in the research that can be undertaken when applying techniques from very different disciplines to a humanities research problem, although concrete research outcomes with any impact are yet to be produced. I look forward to exploring the data soon. Of course, it is true that interdisciplinary scholarship exists in many areas of research, in the sciences, social sciences, arts and humanities. Why interdisciplinary research is particularly pertinent to me, though, is the fact that, to a certain extent, all digital humanities research is by definition operating on this scholarly divide between computational method and humanities investigation. In order to do my research, like many digital humanists, there is a pragmatic need to assemble a team of people with wide range of skills to fully investigate a digital humanities research question. Potentially that means I am a jack of all trades and a master of none. But, I think it is important to think more about the nature of connections between disciplines, and what we can learn from each other. I am incredibly lucky that I have the freedom to roam between disciplines and faculties at Durham to seek out interesting people and projects. This project has not only taught me a lot about psychology, attention and visual cognition, but I have also learnt a lot about Spanish Art. I am a massive museum nerd, and proud, but normally, I prefer to look at objects, sculpture and graphic prints rather than paintings but working on a project focused on 17th century paintings has really upped my appreciation of the artform. So not only am I exploring new research, I am learning to love paintings. winner. External participation in exhibition design and development is being used more and more in museums, galleries and science centres, in an attempt to enhance the institution’s relevance and accessibility for visitors and help inform and energise the design process. For the past year we have been working on a participatory design project which is exploring the challenges and benefits of partnership working between the Centre for Life and Durham University, and whether it is possible to successfully collaborate and co-produce new gallery exhibits that enhance creativity and innovation in young visitors. We are particularly interested in finding out if we can design an engaging exhibit for visitors but also an exhibit that can actively capture useful research data (and lots of it). In essence we are trying to work together to blur the boundary between research and practice. So far we have been using participatory action research (PAR) as a framework to help us through the design process because it is based on good communication, cooperation, collaboration and trust. We have used the PAR approach to co-produce a series of simple design decisions to iteratively develop a new exhibit pod – specifically to encourage creativity and innovation, and to allow us to collect data and hopefully measure creativity. The exhibit pod hosting the experiments is now in the new permanent gallery the Brain Zone, at the Centre for life. It has been a really interesting process to date, not only working with the Centre for Life (who are awesome) but also working with a range of academics at Durham from anthropologists who are really keen on social learning and behavioural innovation in fish to information systems specialists who focus on change management. Now that the first exhibit is live in the Brain Zone we are actively collecting data, so we shall see whether or not it works. The project has a website which will be updated regularly with what we find out. In October I took part in the DAH Institute at the Royal Irish Academy. The theme of the Institute was Networks – all sorts of ideas spring to mind when you think of Networks – networked data, digital networks, networked society. But I’m more interested in networks of people and networks of ideas. 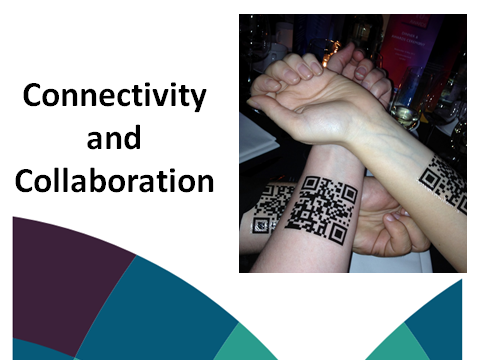 So my talk focused on networks of people and how they collaborate in digital humanities. 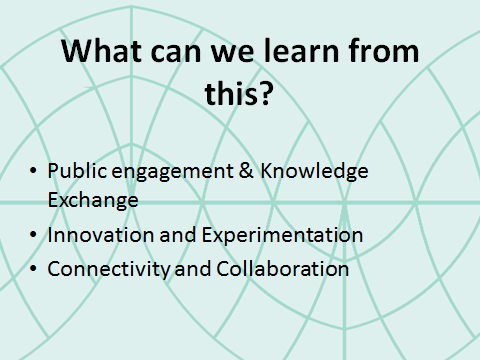 Here are some of my key points from my presentation about how to work collaboratively. Each point is accompanied by spectacular images from Flickr Commons. Ruth the acrobat is a personal favourite. There are multiple definitions of what the Digital Humanities actually is – my definition of DH maybe very different to your definition (and that is great). But when you embark upon a collaborative project – and the likelyhood is as you climb the academic ladder, or if you move out of academia to work in industry, cultural heritage etc you will have to work collaboratively. When you embark upon a collaborative project there is a presumption that you are all talking in the same language. You will make assumptions about the other persons discipline and vise versa. At the beginning of a collaborative project spend the time just talking. Don’t rely on email because things can get lost in translation. It’s really important to have a common language. Spend time building relationships and understandings and figuring out how you all measure success at the start. Be like Ruth the acrobat – be flexible. Learn to adapt and to compromise. Both in terms of Time and Space – Flexibility, adaptability and accepting change and dealing with it. This might seem out of context when talking about collaboration. But it is very important to be clear about what you are going to get out of the project, and out of the collaboration. What is going to further your aims? Be clear about what you and your collaborators want to get out of it from the beginning. This is a postcard from 1925 held in State Library and Archives of Florida. Meant to represent thinking outside the box. Thinking outside the box, establishing multidisciplinary research teams and international collaborations with galleries, libraries, archives and museums, institutions outside academia. Start to push the boundaries of existing technologies and methodologies. Ask more questions. Aim to create an environment which is open to experimentation and innovation. 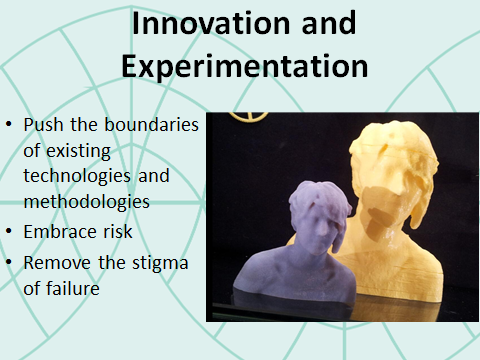 Innovation and experimentation are closely related to Risk. But how much risk is too much risk? This is an important question which needs to be explored. I think we need to create a culture in academia that embraces risk is a prerequisite to allow significant innovation to take hold. Take risks, and don’t be afraid to fail. Failing means we learn how to do things better next time. There is plenty of discussion about collaboration in Digital Humanities, and everyone will work collaboratively in different ways, that is why it is so exciting. These are my 4 key points, what are yours? 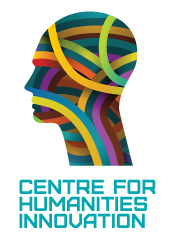 On Monday 22nd June, 2015, I had the pleasure of taking part in The Durham Centre for Humanities Innovation (CHI – pronounced like Thi-Chi) workshop looking at The Emerging Humanities: Strategies for the Future. The aim of the workshop was to explore the Institute for Advanced Study theme of Emergence, as applied to the emergence of new ideas, approaches and disciplinary trends in the humanities. It was a great day with lots of stimulating discussions, a big thanks to all of the organisers. During my talk, I took the opportunity to think about the possibilities of taking digital humanities research outside universities and into cultural heritage organisations. As it turns out my talk was quite lively, and in fact quite different to many of the presentations during the workshop. So I thought I would include the slides and my notes to act as an explanation – the notes themselves might not accurately reflect the exact words spoken – once I’m on a roll lots of thoughts come tumbling out. 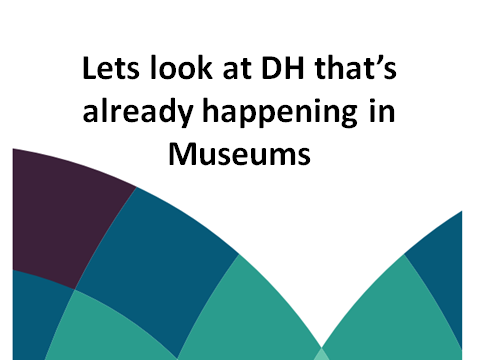 I was initially inspired by Sheila A. Brennan’s blog post DH Centered in Museums? which discussed her lecture at John Nicholas Brown Public Humanities Center. The Lecture focused on the brilliant idea that Digital Humanities centres might benefit from moving into a museum setting. Of course! Why hasn’t anyone done that yet!? (and if it has been done – can you let me know where? Because I want to visit!) This also follows on from Neal Stimler’s panel discussion in Atlanta in 2011 at the Museums Computer Network about the future of digital humanities in museums, which I was lucky enough to attend. There are some excellent video contributions as part of this panel over on YouTube. I also pinched the slide design from the DH2015 poster – I thought it would be good to have a digital humanities colour scheme to support my points. I hope nobody minds! 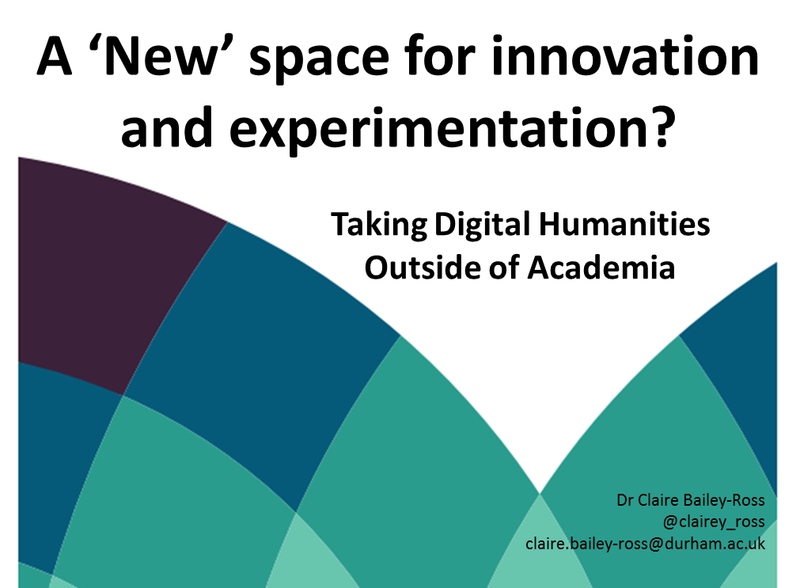 Taking the idea of taking Digital Humanities out of universities as a starting point led me to think about how we can create new spaces of innovation and experimentation and how digital humanities could be used as a starting point for thinking about the future of humanities communication and public engagement. Why did I start a talk around the future of humanities with a slide about science communication? Well… There is a strong history and active research practice surrounding science communication but this if often lacking in the arts and humanities research. I think we can learn a lot from science communication. Science communication generally refers to public communication presenting science-related topics to non-experts. Essentially it’s about communicating scientific outputs of research in an engaging way. This often involves professional scientists, but has also evolved into a professional field in its own right. The art of science communication is to pitch something traditionally perceived as complicated in a way that is not only engaging but also faithful to the evidence. In essence making science accessible, engaging and exciting to non-scientists. A definition of Science communication that I really like is one with all the Vowels! It is one of the most representative definitions of Science Communication. 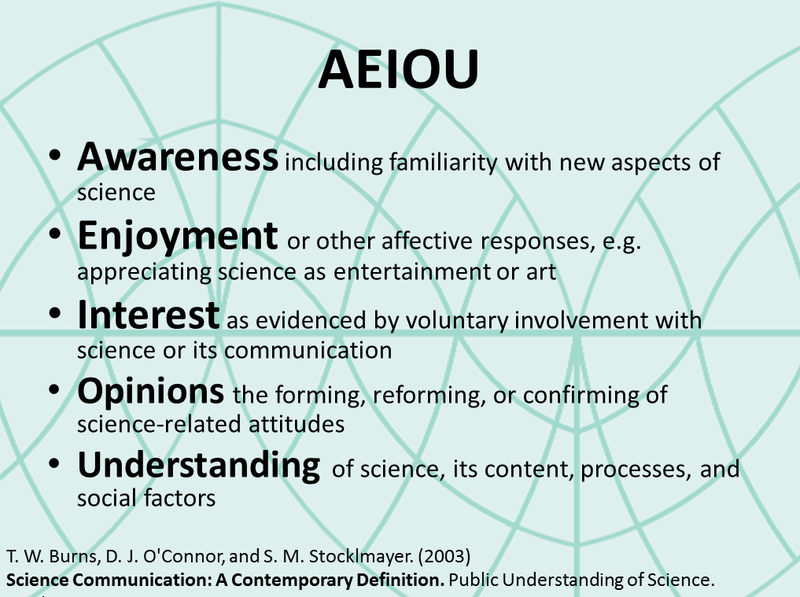 The AEIOU definition of science communication by Burns, O’Connor, and Stocklmayer. (2003). This looks at the use of appropriate skills, media, activities, and dialogue to produce one or more of the personal responses to science (the vowel analogy). 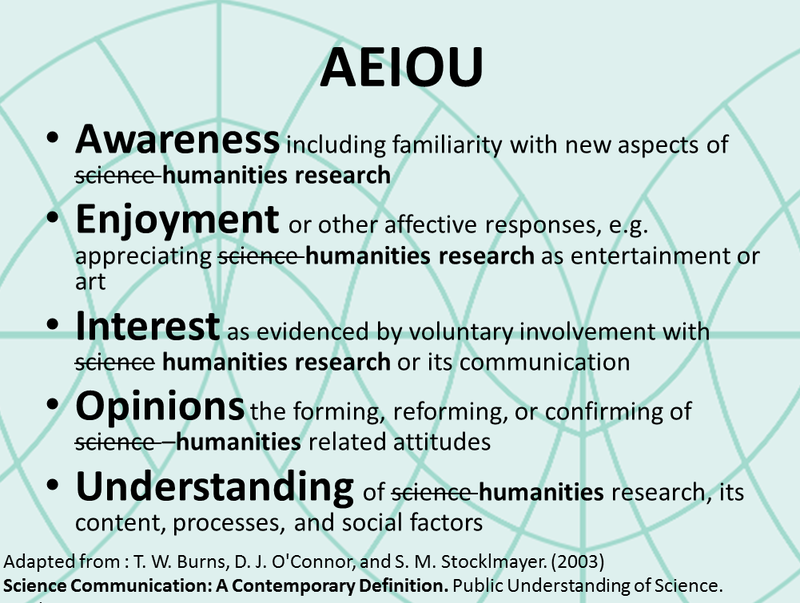 Personally, I think that the five components of the AEIOU approach is a good way of thinking through a process of active participation in not only science communication but Humanities communication. The SciCom definition was to provide a bit of context before getting on to an issue within the humanities. 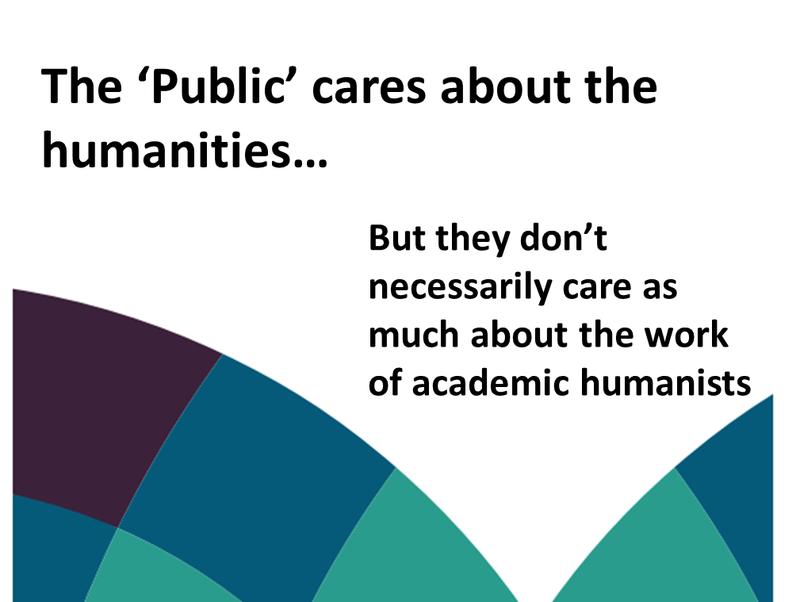 The ‘Public’ cares about the humanities…But they don’t necessarily care (care is probably a strong word – so lets change that to understand) understand as much about the work of academic humanists. There are differences between individuals (including their backgrounds, interests, economic circumstances, gender, sexuality etc ) which shape their own sense of themselves and their agency. 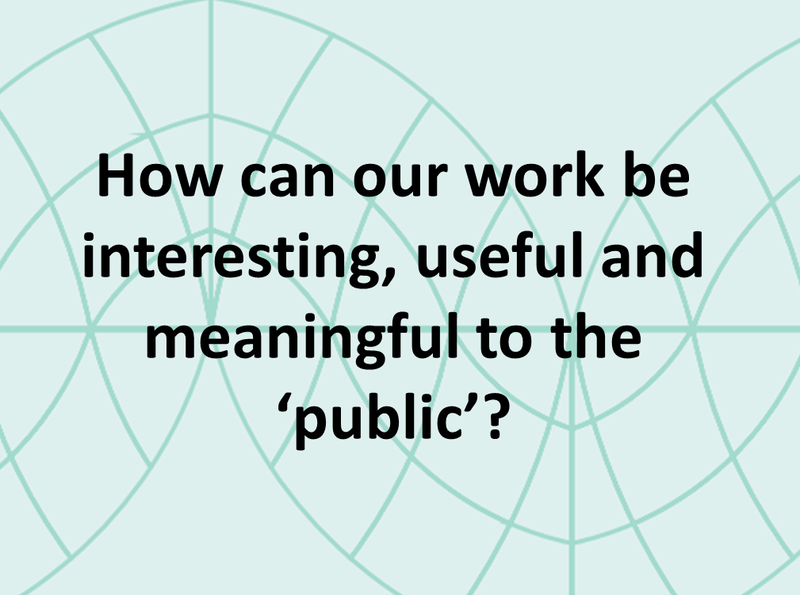 How can our work be interesting useful and meaningful to the ‘public’? There are multiple ways. There is huge potential to develop new ways of working to enhance access and awareness, engagement and enjoyment, creativity and interest in Arts & Humanities research. At the workshop I discussed one potential way digital humanities can be used to change our relationship with the public. So I asked can digital humanities be a conduit between the public and the academy? Or can it be a new kind of multivocal conversation that the public can join? 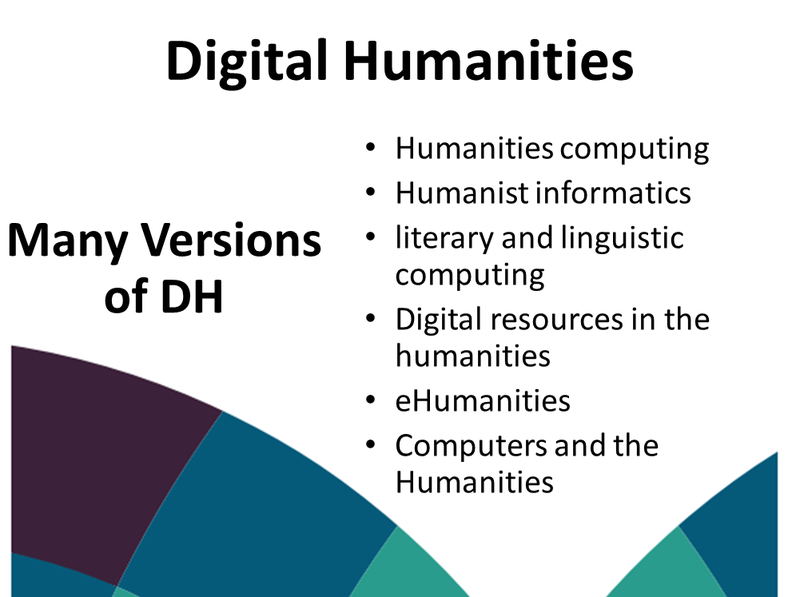 Over the past 20 years or so, the field we now refer to as digital humanities has been known by many terms: humanities computing, Humanist informatics, literary and linguistic computing and digital resources in the humanities to name a few. Most recently it has predominately been known as digital humanities. But what is it in the first place? Is it an amorphous field that had become a catch-all for anyone doing anything remotely “digi-savvy” in the Humanities? The question of what is DH seems to be repeatedly asked, but seldom answered to anyone’s satisfaction. It may even be that the act of asking is, in itself, what some scholars think digital humanities are about. To me it’s a very loose confederation of researchers that are engaged in A&H research, from different disciplines and sectors. It is a Community of practice. Researchers who are using digital in various ways to raise and address new questions exploring how we can apply technology to our experience of the arts, humanities, culture, & heritage. DH questions how technology changes the environment around us, physical and digital, and discusses whether those changes are for the better. The focus of my talk was a discussion of alternate futures of digital humanities outside of the university. So, I thought I would take the opportunity to think about the possibilities of taking digital humanities research outside universities and into cultural heritage organisations. And I wanted to discuss with the group, if being more connected, engaged, interdisciplinary and innovative makes sense, if it is actually practical, or if we all just need to collaborate more. I often think that potentially the future of humanities research is not within the traditional constrains of academia, but is an open, collaboration between the cultural sector and academics in public space. Enabling the exploration of the importance and benefits of cross-sector and public collaboration and engagement. So, can cultural heritage practice foster public engagement and greater collaboration amongst researchers and the public? We are now being asked more and more to demonstrate our social impact. So can working with and learning from museum, library and archive practice provide opportunities for researchers to work collaboratively, become more open and transparent to show the relevance of their research to society? But rather than the title of the talk Taking Digital Humanities Outside of Academia – what if it is already out there? 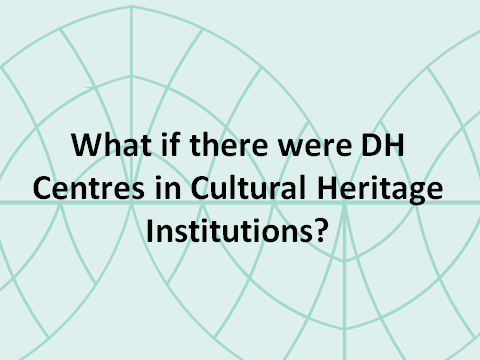 So Interestingly DH happens in cultural heritage organisations, but just isn’t called that. “Digital humanities” is a very academic term, and is irrelevant to some. This raises issues around if we need to define Digital Humanities? Should we just get on with the doing rather than getting bogged down in definitions that are limiting. Thinking broadly helps to think of multiple roots to Digital Humanities projects and to its multiple futures. The Cleveland Museum of Art’s Gallery One. Gallery One is transforming how museums can incorporate visitors’ active participation in gallery spaces. It opened to tremendous acclaim and fanfare with a range of digital interactives throughout the gallery space offering opportunities for visitors to participate. 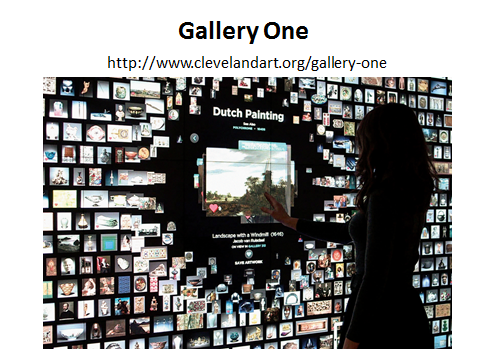 The image is of the Collection Wall – it is one of the largest multi-touch screen in the US—a 40-foot, interactive, microtile wall featuring over 4,100 works of art from the permanent collection (most of which are on view in the galleries). It’s purpose is to facilitate discovery and dialogue with other visitors and can to act as an orientation experience, allowing visitors to download existing tours or create their own tours to take out into the galleries on iPads and mobiles. The Collection Wall enables each visitor to connect with objects in the collection in a playful and original way, making their visit a more powerful personal meaningful experience. Gallery One is, to date, the only non-science gallery which main focus is to use innovative technology to shift the visitor experience to emphasise engagement, curiosity and creativity. The scale of public participation in crowdsourcing projects is impressively large. The Zooniverse projects have more than 800,000 registered users, (www.zooniverse.org). 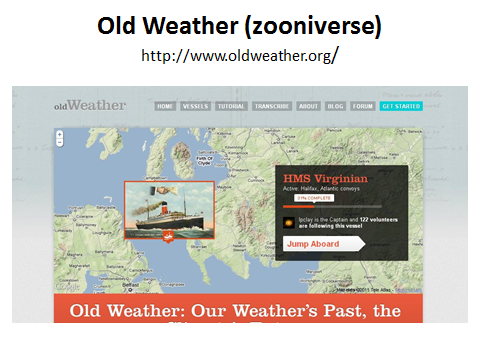 A nice humanities example is Old Weather a collaboration between Zooniverse and The National Maritime Museum. Where users transcribe historical ships’ logs. These transcriptions contribute to climate model projections and will improve our knowledge of past environmental conditions. Old Weather project transcribed over a million pages from thousands of Royal Navy logs in less than two years. Museums obviously focus around visual and object collections and are very good at connecting and visulizing that data. 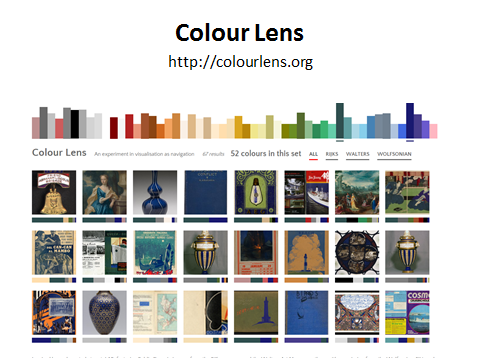 For example colour lens visualizes multiple collections by colour. It makes use of Public Domain images from the Rijksmuseum, the Walters Art Museum (Balitmore), and others with permission from the Wolfsonian-FIU (Miami), and was developed using code from Tate and the Cooper-Hewitt Museum. Highlighting that once digitised collections are available via an API (application program interface – a set of routines, protocols, and tools for building software applications), they can be used them and put them into context with other objects. The British Library’s Georeferencer project is crowdsourcing location data to make a selection of its vast collections of historical maps fully searchable and viewable and comparable to modern maps. 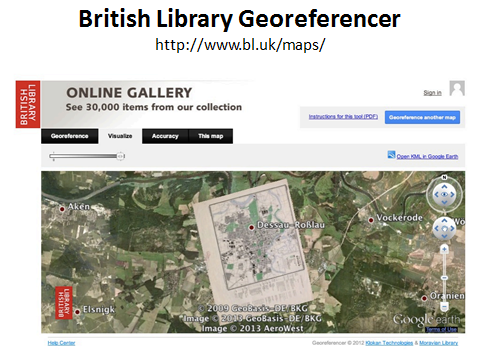 So far they have georeferenced 50213 Maps within 17th, 18th, and 19th-century Books. (they have just added a further 50,000 more digitised maps to be georeferenced). 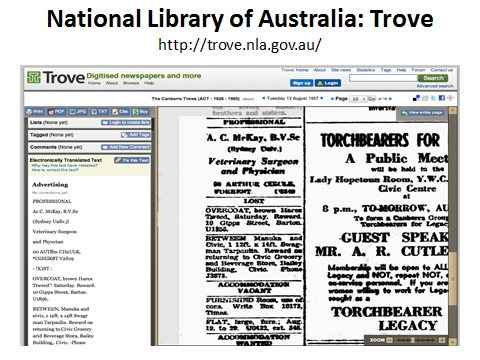 Trove, which crowdsources annotations and corrections to scanned newspaper text in the collections of the National Library of Australia, has around 75,000 users who have produced nearly over 130 million transcription corrections since 2008. Paul Hagon from Trove estimated that if they had to employ staff it would have cost in the vicinity of $12 million. I’m cheating a bit here because I’m talking about special collections within a university with this one. 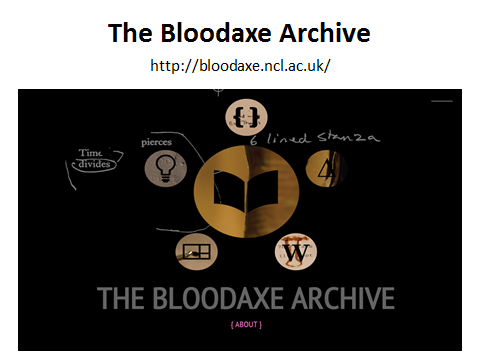 The archive of Bloodaxe Books, newly acquired by Newcastle University, is one of the most extensive and significant poetry archives in the world. The aim was to be more creative, open-ended and playful with the archive. Designing new digital interfaces which enable new ways to explore and think about poetry. These interactions are made possible through reframing the traditional idea of an archive, by questioning the notion of search as simply objective and designing new kinds of playful participatory interfaces with archive material. The Great Parchment book held in the London Metropolitan Archive, is a crucial historical text documenting the City of London’s role in 17th century Ulster that was previously unreadable for over 200 years due to fire damage. The manuscript consisted of 165 separate parchment pages, all of which suffered damage in the fire in 1786. The uneven shrinkage and distortion caused by fire had rendered much of the text illegible. 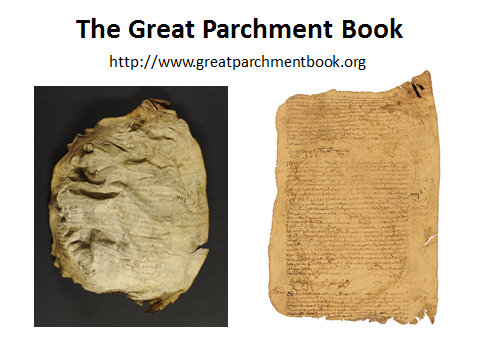 The project was a large collaborative undertaking in which the practical conservation of the Great Parchment Book was the essential first step, followed by the digital imaging and flattening work. After that, the aim was to develop a readable and exploitable version of the text, comprising a searchable transcription and glossary of the manuscript. The ultimate goal of the project was to publish both the images and transcript online. So what can we learn from the cultural heritage sector and from digital humanities projects about future directions of humanities research? I should probably say at this point that I am interested in this from two sides – for over ten years I have worked in and around museums on a range of digital projects, and for the past 5 years I have been an academic digital humanist. My background in these two fields have shaped my perspective massively. I strongly feel that important things can be learnt from working with cultural heritage sectors – particularly that surprising research findings and/ or ideas for future research can emerge from working with non academic collaborators. As public institutions, museums, libraries and archives have hundreds of years of practice with educating the public about cultures, art, and humanities. While, like universities, museums have at times been challenged by the change from broadcasting education to engaging in dialogue with the public, there are a range of successful models for deep engagement and collaboration with the public that we can learn from. Obviously with the emphasis on the idea of impact in the REF there has been a big shift and it has changed the landscape of research. 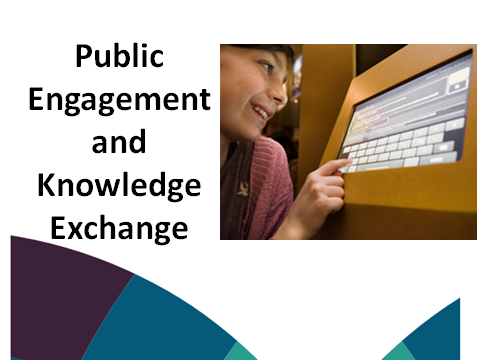 But public engagement and knowledge exchange shouldn’t just be for ticking boxes and form filling. PE should not be a new and separate activity for humanities researchers, but rather part of research, teaching, learning and knowledge exchange. Effective public engagement informs research, enhances teaching and learning, and increases our impact on society. Done right, engagement should be transformative for all sides. According to the National Co-ordinating Centre for Public Engagement, engagement ‘is by definition a two-way process, involving interaction and listening, with the goal of generating mutual benefit.’ So a two-way exchange of ideas, information and insights, but it is acknowledged that there can be many ways in which humanities researchers can interact with the public. I am a huge advocate of public engagement and knowledge exchange, and I do believe we can learn a lot from museums, libraries and archives about how thinking creatively about academic research can enable us to speak to a wide range of audiences, even when the research subject seems to be quite specialised. I believe that communicating research to a wider audience is neither time-wasting nor trivializing, but can bring benefits to academics and the public alike. Thinking outside the box, establishing multidisciplinary research teams and international collaborations with the cultural heritage sector outside academia, push the boundaries of existing technologies and methodologies. Creating an environment which is open to experimentation and innovation. Museums, libraries and archives have made great efforts to support new research into digital technologies that seek to change the way audiences engage with material culture and heritage. Each of the projects I have mentioned demonstrates how cultural organisations been up for innovation and experimentation and beginning to bridge the divide between research and innovation that has public impact. Innovation and experimentation are closely related to Risk. Innovation and experimentation in museums, libraries and archives has been a growing topic of conversation of late, and an increasing number of organisations have gone down the path of taking risks and developing new kinds of projects that push the boundaries. A certain amount of risk is always associated with digital projects because they are ‘new,’ ‘innovative’ and ‘cool,’ but there are uncertainties about how much risk is too much risk. How far can the boundaries be pushed with one project and how much tolerance does the institution have? These are questions that many are now facing and questions which many digital humanists are trying to tackle. Creating a culture in academia that embraces risk is a prerequisite to allow significant innovation to take hold. Digital Museums, Libraries and Archives projects are pushing the boundaries by Recognising that by attempting innovation you expose yourself to risk. The freedom to innovate can only happen when researchers remove the stigma of failure from the process. Instead, celebrate failure as a badge of honour and a key component needed to break old models and embrace innovation. Ultimately, this presentation proposes that there is a need for collaboration between memory institutions and digital humanities, and that the role of the digital humanities researcher is evolving in order to effectively integrate memory institutions and the public as a partner in future scholarship. There is an dominate stereotypical image of a lone scholar in humanities research surrounded by books (not people), with an inability to communicate with the wider world, a certain amount of reservedness and inwardness. There is a strong association with isolation. But we all know that it is the productive conversations with one another that makes research interesting. But there is still a dominance of the long scholar which it seems important to me to challenge and to question. Whereas the digital humanities tend to be much more collaborative. Collaboration is widely considered to be both synonymous with and essential to Digital Humanities. This is because one person can rarely possess all of the (inter)disciplinary and technical knowledge needed to implement many DH projects. Infact, one of the earliest documented examples of a Digital Humanities project, Fr Roberto Busa’s Index Thomisticus (a project started in 1946), was underpinned by a wide-ranging collaboration, not only with IBM, but also including, at one point, a team of 60 who worked directly on the project. Why do digital humanities scholars collaborate more frequently than ―traditional humanities scholars? What difference does collaboration make? A survey (by Lynne Siemens at UVIC published in 2011) of digital humanities research teams found that the most common reasons researchers cited for working together are ―Team members have different skill sets and Collaboration is more productive than individual work. Perhaps the digital humanities point to a future for the humanities in general to be more open, engaged, and transdisciplinary. We all are facing the data deluge, and all are part of a knowledge society that is transitioning rapidly to the digital. It’s important to try to addresses how modes of knowledge production and dissemination are changing as information becomes digitally networked -humanities scholars have to envision new ways of doing their work. Most of the research sources will be digital, as will the publishing environments. Scholars will need to devise methods to harness abundant information, explore new questions, and represent their ideas in new ways. In the face of skepticism of the value of the humanities, many digital humanities projects working with cultural organisations demonstrate how the humanities can be more interactive, interdisciplinary, and engaged, enabling scholars and the public alike to create and share knowledge. The main argument being put forward is that humanities researchers should embrace the opportunity to learn from and work with cultural organisations and digital humanists to form a connection between academia and the public. We need to think less about completed projects and more about work in process, iterative runs and learning from failure; think less about individual authorship and more about collaboration; think less about ownership, authorship and authority and more about sharing and co-creation, and think less about broadcast and more about dialogue. It is my hope that the reflections in this presentation will help to stimulate dialogue, and suggest future directions for a conversation about public engagement, cultural heritage, and arts and humanities research. This conversation is more pressing than ever, but must continue to welcome new, more diverse and at times discordant voices to the table. Does Digital Humanities embrace difference? Different interpretations, perspectives & disciplines? Following on from the Defining the Digital in Arts and Humanities research post, this post will discuss the first half day session at the Northern Bridge Summer School held at Newcastle University in The Great North Museum on the 4-5th June 2015. The session focused on Exploring the Digital in the Arts and Humanities. The aim was to emphasise that Digital Humanities embraces difference whether that be different interpretations, perspectives or disciplines. So is Digital Humanities perceived as a Big Tent? The “Big Tent” was the theme of DH 2011, and since then this issue of “Big Tent Digital Humanities” has stimulated numerous discussions about the inclusive and interdisciplinary nature of the discipline. “Big Tent Digital Humanities”, deliberately opens and muddles the focus of the field and it has even been suggested that “Everything is Digital Humanities! Everyone is a digital humanist!” (Melissa Terras 2011). Well at least that’s what those that self-identify as Digital Humanist’s have a tendency to think. But what about those who don’t identify as Digital Humanists? Like the Northern Bridge Students. What do they think about digital scholarship and the impact it is having? The doctoral student participants were invited to gather in specific disciplinary groups to consider the question of how digital impacts on their discipline and their personal research agendas. The groups were tasked with thinking of 3 ways digital is shaping their discipline. The discussion and feedback from the specific discipline groups highlighted an exciting range of perspectives. This really hit home the diversity in Arts and Humanities research. It was fantastic to see the differences and the commonalities when it comes to thinking about digital. Access of information – easy access to sources from dispersed areas. Enabling research rather than shaping it. Connecting the field – networking and collaboration. The Limiting access of digital – there needs to be an awareness of the digital divide. Range of digital resources, accessibility and novel ways of interrogating sources. Information management, specifically reference management. With accompanying advantages and disadvantages. Dissemination of research – sharing research widely. Concern of publishing unfinished material, accuracy of digital sources and information, but the digital also gives access to unrefined materials. Dissemination of research – increasing conversations and access to research. Ask not what you can do for the internet, but what the internet can do for you. Serendipity of the bookshelf – not easy to do digitally, but if you know what you are looking for digital tools can help accessibility and findability of real objects – finding things to use in research. Digital as a medium in itself but does this impact on tangibility and aura? Is this lost in digital media? Using a computer to understand the human element. Digital tools can be useful, but it shouldn’t be leading us. Digital resources are often used naturally, perhaps researchers don’t consider it as DH. Digital can increase ability to collaborate. Anxiety – Should we always be using digital, even when it is not necessarily relevant to research? Greater scope for your research library – but you can only find what you know it is there. Serendipity of bookshelf is often lacking in digital resources. Media savvy generation – should be using digital resources and tools. Impact of research and employability. DH is a good way to highlight relevance of research. Archaeology has already been using technology for a long time. Changing expectations of what we can achieve – speed of changing expectations – The digital is changing expectations of research and researchers at an alarming rate. You can invest a lot of time in learning how to use new technology, is it worth it? Remodelling knowledge – interacting in a more organic way. Visualisation of data – maps, GIS etc – archaeologists have always used digital tools to help visualise their data. Transformative – access, publish, analysis, process, software, interdisciplinary. Critical thinking – why are we using technology – how does it help? Should we be using it? We need to ‘Engage the brain’ – why are we using digital technology, and is it really helping us? There is a need for critical engagement and thinking when using digital tools. Digital tools enable wider dissemination, increases accessibility and findability of research. Offers exciting possibilities for interdisciplinary approaches. The challenge of digital attribution is an issue. Serendipity of the bookshelf – how can we retain/regain serendipity in the digital? Trepidation about the use of some digital resources. Engaging globally, increased opportunities, to be part of a virtual community. Thinking about the nature of engagement, and what that means and offers. The digital humanities have some internal tensions, such as the occasional divide between builders and theorizers, and coders and non-coders. But the field, as a whole, seems to be developing an in-group, out-group dynamic that threatens to replicate the culture of Big Theory back in the 80s and 90s, which was alienating to so many people. It’s perceptible in the universe of Twitter: We read it, but we do not participate. It’s the cool-kids’ table. So, the digital humanities seem more exclusive, more cliquish, than they did even one year ago (Pannapacker 2011). So it was nice to see so many commonalities between the disciplines when thinking about how digital is shaping their subject. This to me really highlights what DH is all about – a broad spectrum of multidisciplinary academic individuals and approaches, which come together with a shared interest in technology and humanities research. The follow-up exercise involved taking the ideas and points raised in the first session into multidisciplinary groups to think about and compile a manifesto/charter for the Northern Bridge Training Partnership. The challenge was to suggest ways that Northern Bridge and its strategic partners could best meet the needs and requirements of students to equip them for emerging digital scholarship and perhaps even develop a leading position in doctoral training in this area. Shawn has written an excellent summary of this over at Digital Humanities @ the library. A big thank you to all the conveners and to all the Northern Bridge participants for an energizing and thought provoking session and conference. Digital Humanities? What on earth is it? Tools for research? cultural expectations? understanding pervasive technology in society? We asked the Northern Bridge doctoral candidates to define and discuss. On the 4th -5th June 2015 I had the pleasure of taking part in the Annual Northern Bridge Training Programme Summer School held at Newcastle University in The Great North Museum . The Northern Bridge is a doctoral training partnership between Newcastle University, Durham University and Queen’s University Belfast, funded by the Arts and Humanities Research Council (AHRC). The 2015 Summer School theme focused on Digital Humanities and it produced a stimulating environment to discuss, share and learn about the impact of the digital on arts and humanities scholarship. Digital Humanities is becoming an increasingly popular focus for academic research and discussion. There are now hundreds of Digital Humanities centres and there has been an expansion in digital humanities taught courses, journals, and conferences. But what is actually understood by the term ‘Digital Humanities’ is still up for debate. Alongside the brilliant Shawn Day (lecturer at University College Cork, Queen’s University Belfast and Trinity College Dublin), Ian Johnson (Archivist at Newcastle University Special Collections) and Deirdre Wildy (Head of Special Collections & Archives at Queen’s University Belfast) we challenged the doctoral candidates to consider how emerging digital tools and methodologies impact on their own doctoral studies. Before the Summer School started we circulated a short questionnaire to stimulate thoughts about digital scholarship. 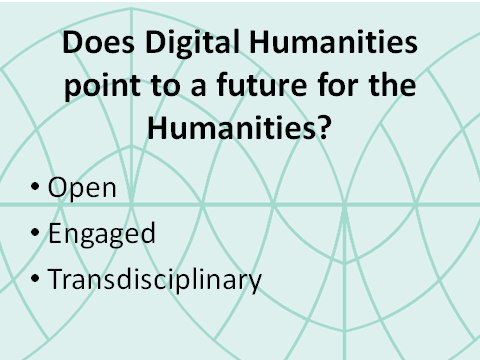 One of the most interesting questions enquired as to what the doctoral candiates understood by Digital Humanities. As part of the form, we asked, ” What do you understand to mean by Digital Humanities in 140 characters?” – and received a surprisingly interesting set of answers. This list of definitions proved to be a very interesting starting point for exploring the Digital in the Arts and Humanities within the Northern Bridge Consortium. In comparison to A Day in the Life of the Digital Humanities (Day of DH), which is a community documentation project that brings together digital humanists from around the world to document what they do and how they define Digital Humanities, none of the Northern Bridge consortium self-identified as digital humanities scholars. 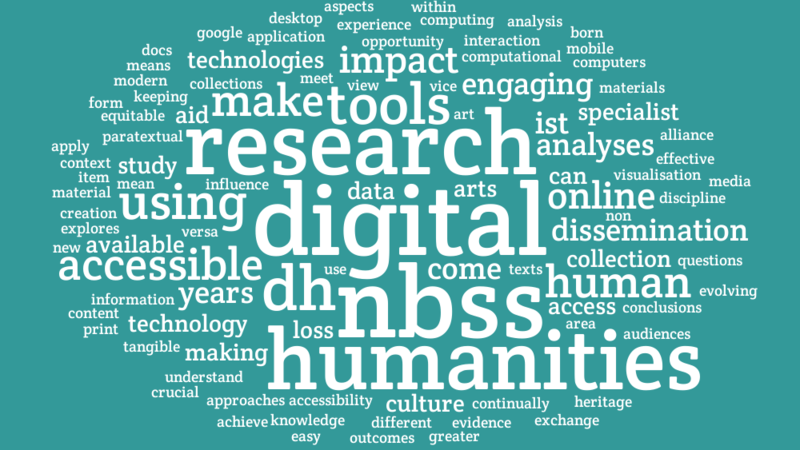 So it was very interesting to see what ‘non DHers’ had to say about digital humanities. #NBSS2015 What are the digital humanities? Humanities scholars working in a new virtual space - like a library but online! The definitions were tweeted using the hashtag #NBSS2015 and were processed through Textal to explore the relationships between words in the text via a snazzy word cloud interface. What came out most strongly to me was the emphasis on tools and dissemination. Digital as an output rather than a process or an object of study in its own right. Lots has already been written about how digital humanities might be defined (see the excellent Defining Digital Humanities edited by Melissa Terras, Julianne Nyhan and Edward Vanhoutte for a full volume on the subject) and the question of ‘What is digital humanities?’ continues to be a rich source of intellectual debate for scholars. It was fascinating to hear what the next generation of PhD students felt to be important in defining DH. It raises some interesting perspectives about how digital arts & humanities may be represented in the future. It’s exciting to see how the established boundaries between, and relationships among, arts and humanities scholars are being re-imagined through the use of digital technology and the dynamic forms of engagement, discussion and collaboration it is enabling. What Can We Learn from Digital Artists’ Projects in Museums? Innovation and experimentation in museums has been a growing topic of conversation of late, and an increasing number of organisations have gone down the path of taking risks and developing new kinds of projects that push the boundaries. As part of this shift in museums, more and more institutions are working with artists in new ways that go far beyond simply placing their works on the walls. New collaborative projects that consider the roles of art, artists, and visitors from a fresh perspective are becoming more common. More museums are inviting artists to bring their creative artistic practice to focus on museum collections and on creating new participatory and immersive experiences that actively engage visitors and, in many cases, also interrogate the role of the museum. While you do hear stories about these types of projects meeting some resistance from within the museum for seeming to be trivial, ‘arty-farty’ or without intellectual content, in my opinion more often than not these collaborative creative projects largely succeed in transforming museums into spaces of curiosity, experience, collaboration, risk-taking, and creativity. This post looks at the process of working on Decoded 1914-18 as part of the umbrella Wor Life project at Tyne & Wear Archives & Museums. Between October 2014 and February 2015 Tyne & Wear Archives & Museums and Newcastle University Institute for Creative Arts Practice came together to explore some of the issues and questions surrounding experimental digital art projects in museums, thinking about public practice as well as working with digital artists. The final project – Decoded 1914-18 produced a programme of AV installations and events that explored the First World War and its effect on those living in Tyne & Wear. Seven artists took inspiration from Tyne & Wear Archives & Museums (TWAM) collections to create artworks and performances which examined and interpreted Tyne and Wear in the First World War in innovative ways. It was a fantastic process and I learnt a lot, and I have well and truly been bitten by the power of AV for visitor engagement. This is very much something I would agree with after working on the Decoded 1914-18 project. Before I started at Durham University I held the position of the Assistant Digital Officer at TWAM, my role was to work with the Digital Coordinator (the excellent John Coburn) to deliver a programme of digital projects that would innovate digital access to TWAM’s collections and increase public engagement. Decoded1914-18 was one such project. Working with digital artists to create visitor engaging projects inside the museum is fundamentally different from, and more challenging than, simply commissioning works of art. It means working collaboratively and bringing artists and creative practitioners into the organisation, and equally involves bringing museums in to the risk-taking of the creative process. The aim of Decoded 1914-18 was to invite a fresh perspective to discover and reimagine stories and material from museum collections. The project focused on creative arts practice where museum collections, artists and innovative digital practice merge to create a new kind of digital audiovisual experience. This collaborative innovative creative practice fundamentally disrupts the way in which museums interact with, and provide for, visitors. This was no mean feat. Not only did we have an aspirational project to deliver but we were also trying to do it with a difficult and challenging subject matter (the impact of the First World War on the North East), across a range of TWAM venues. It was a risk – and to TWAM’s credit, one it was willing to take. Rob Stein in 2012 suggested that creating a culture in museums that embraces risk is a prerequisite to allow significant innovation to take hold. A certain amount of risk is always associated with digital projects because they are ‘new,’ ‘innovative’ and ‘cool,’ but there are uncertainties about how much risk is too much risk. How far can the boundaries be pushed with one project and how much tolerance does the museum have? These are questions that all museums are now facing and questions which Decoded1914 tried to tackle in a relatively short amount of time and budget. One of the most dramatic effect of digital artists’ interventions in museum spaces is to disrupt the institution’s voice, content and collections so they can be seen, reimagined and presented from a new perspective. This can transform the museum from a place of information and authority to one of experience, engagement and curiosity. For example, one of the Decoded artworks took place in the basement museum store of the Discovery Museum, completely changing the space from a working museum collection store not normally open to the public to an immersive art experience. This was challenging and involved a lot of risk management but the final artwork was well worth the oodles of risk assessments. Including artists in the exhibition process means taking risks and letting go of authority, and challenging staff working practices. All good things in my book. Differing perspectives create tension and friction, sometimes unpredictably so. But tension can be incredibly good for the collaborative and creative process. If everyone worked in the same way, it would make for a very boring world. For Decoded we worked with a range of artists and creative practitioners. I was surprised how much friction there was on some projects, whereas others went smoothly without incident. Now I don’t mean friction in terms of disagreements, misunderstandings or negativity. It is more of a friction in terms of approach and expectations. There was a disconnect between museum timescales and artistic timescales. It was really refreshing to work with varying perspectives on timescales and project management and throughout the process we learnt a lot about expectations around museum collections availability, documentation and retrieval. Despite some difficulties the friction between artists and museums is really interesting.Our ideas were challenged, tested, and in turn better projects were produced. This is the kind of useful friction that leads to new ways of working. It highlights the challenges of working in a museum, and particularly highlights the need for museums to evolve their understanding around public expectations of collections access in projects. Friction pushes all staff and can innovate all areas of the museum, by engaging them in the creative process. Flexibility, adaptability and accepting change became key components of the Decoded project. The nature of creative practice means that things can change quite quickly and often, for example in terms of what is possible. As a result of such changes, there can be impacts upon such things as collections material availability, installation, and evaluation. There is therefore a need to be able to react quickly to changes to the project, by both the artist and the museum, but also to find the space to accommodate these. It is important to constantly refer back to the aims and objectives of the project, and to reflect. Both artists and museum staff need to become very good at adapting to change and adjusting the process accordingly to match that change. By working with digital artists to reimagine museum collections, it encourages dialogue, provocation, and confusion for staff and for visitors. Confusion is a profound tool, because it prompts museum staff and the visitors to ask questions. Seeing museum collections through an artist perspective has really challenged my perceptions of what is possible when it comes to digital interpretation. It has made me think beyond text and image and to look at the abstract, the immersive and the noisy. Decoded resulted in a two week temporary installation, it was ephemeral by its very nature. It’s not unusual for artists’ projects in museums to be ephemeral, which makes documenting them essential. They are full of lessons that can guide future projects inside and outside the museum, so despite the short nature of the installation, it is important to document the process and the outcomes. For Decoded we decided to use video to document the process of the project as well as to act as a legacy for each of the Decoded artworks. This rich video documentation serves as a archive of ideas that can be used as inspiration for future digital projects. A big thank you to all the artists,TWAM and Newcastle University Institute for Creative Arts Practice, and Dominic Smith. It was a great project! I’d love to know what you think. What else can we learn from digital artists’ projects in museums? What have I missed? Are the learnings different with an artist in residence project compared to a collaboration for a specific theme? What is Digital Change in Museums anyway? Or to put another way: Do we need to understand Digital Change in Museums? I’ve been thinking about digital change a lot lately. Change is very difficult to do, let alone manage, and what happens when you throw digital into the mix? We continuously wonder and marvel at the possibilities digital presents, yet we seem to be constantly separating ‘digital’ out as an individual entity and therefore struggle to make sense of its impact on our lives. And if individuals find it difficult to understand, adapt and accept these digital transformations, how do cultural organisations deal with digital change? But the more I think about digital change, the more I begin to wonder what on earth is it? Is the term ‘digital change’ a bit of a misnomer? Is it still true are we really struggling to understand digital? Personally I feel like we are at a tipping point, where digital isn’t something separate anymore but is something which is embraced and no-one runs screaming from the building when the term is mentioned. Today digital touches everyone and everything. It is part of everyday life – communications, retail, entertainment, education, medicine etc. So why when it comes to museums and change is it seen as something separate, and actually quite daunting? Over the past few weeks there has been the Arts Council and Culture 24 Digital Change: seizing the opportunity online’ event at BALTIC – Centre for Contemporary Art and the Richard Dimbleby Lecture 2015 by Baroness Martha Lane Fox – both discussing the need for change when it comes to understanding technology and the internet. But what does Digital Change actually mean to cultural organisations? How is it defined? How is it understood? And what is the appropriate response? It may very well mean one thing to large national cultural institutions – “Digital as a Dimension of everything” from the Tate springs to mind and large ongoing digital transformations at the nationals are prime examples, leading Ross Parry to believe that the cultural sector is at the beginnings of being ‘Post Digital’. But what about the smaller organisations? The museums in the regions? Are they ‘Post Digital’? Do they understand digital change? One thing the Digital Change conference at the Baltic discussed was the fact that doing digital well is difficult. “It takes skills that cultural organisations often don’t have in-house, it costs money they don’t have and it’s hard to measure if anything is really having an impact.” This doesn’t sound like something that has been accepted and embraced now does it? But really should we be talking about digital change or just change? Instead of thinking digital change perhaps we should be thinking about organisational change and how it is managed within museums. Ultimately how we think about and understand change affects our ability to anticipate, shape and direct it using digital technologies. Within museums there is a sense of fluid, fast-moving change arising from the proliferation of digital technologies. Signs and talk of change are everywhere. But, there’s no avoiding that museums are generally conservative, and change and innovation are often lost in translation in between the realms of bureaucracy, financial streamlining and supposed time and resource efficiency savings. This friction is clearly a frustration for those angling for change. Perhaps we should reconsider the overemphasis on digital and of digital strategies and planning in our discussions and management of change processes within museums. Instead, we should focus our attention and effort on the dynamic, interactive and conversational basis of organisational change. One of the best books I’ve read about museums and change is Robert Janes’ Museums and the Paradox of Change. It suggests understanding change is more about encouraging responsiveness and learning, not necessarily strategic planning. If you haven’t read this book, I do recommend it. It’s a really honest and open account of organisational change within a museum. Once we understand organisational change processes then we can start to think about our ability to predict, shape and direct it using digital technologies.